Our giant toothbrush has been designed to make children and adults smile. We all need to make brushing our teeth a little fun and we certainly could use some laughter when visiting the dentist. 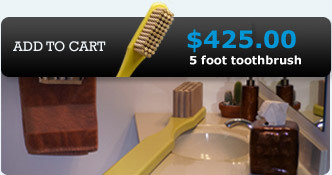 Findadentist.com has the Giant Toothbrush that makes people smile. Every child wants to hold it. Every little one wants to take it home. So get one for your office and snap a photo of your patient standing next to a giant toothbrush. This way they can put their report card and their picture on the refrigerator. What more could you ask for when it comes to making kids happy and sending them a gentle reminder to brush their teeth. They can put their picture with the Giant Toothbrush in their bathroom to also remind them how important it is to go to the dentist and brush. Okay, now that we have taken care of the kids, lets talk about the adults. This is the perfect gift for any dentist or hygienist. Imagine the look on your spouses face when he or she opens up her very own Giant Toothbrush. There is no better gift for the dentist in your life. The Giant Toothbrush looks amazing mounted on the wall of your office or inside your practice. It can be mounted in the waiting room. It looks great in the lobby. 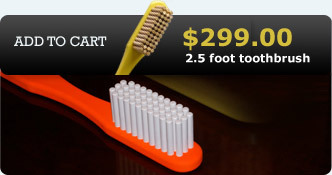 You can put one in each room and everyone will love looking at the life size toothbrush. They are fun and professional at the same time. Each giant toothbrush is hand made in Hudson Valley New York, right along the Hudson River by Westchester Wood, a custom furniture maker. The brushes are made of 100% wood and finished with eco friendly paint. No petrochemicals or plastics that cannot be recycled. The product is 100% green and totally biodegradable. We can customize each brush. You can choose your color and size. We can even make it larger if you desire. We can also put your name or dental practice name on the body of the brush for an additional fee. Please give us a call and let us know how many you would like to order. The holidays are just around the corner, so get your order in today.